NOTE: As Facebook continually updates their ability to search timeline via the graph search, I continue to test and update this post at the bottom, so be sure to read all the way through. If you still have questions, feel free to ask in a comment and I will help where I can. Three different people asked me similar questions about Facebook in the last month, which leads me to believe that, even though this capability has existing for a while, some folks aren’t aware that you can search your Facebook feed for a post from the past. Hey Sean – Can you help me figure out how to find a post that I posted on my own timeline a few years ago? To be clear, I’m just looking to find one of my own status updates, but I don’t want to have to scroll through years of posts. Thanks for asking, Janet! So…here’s the answer. 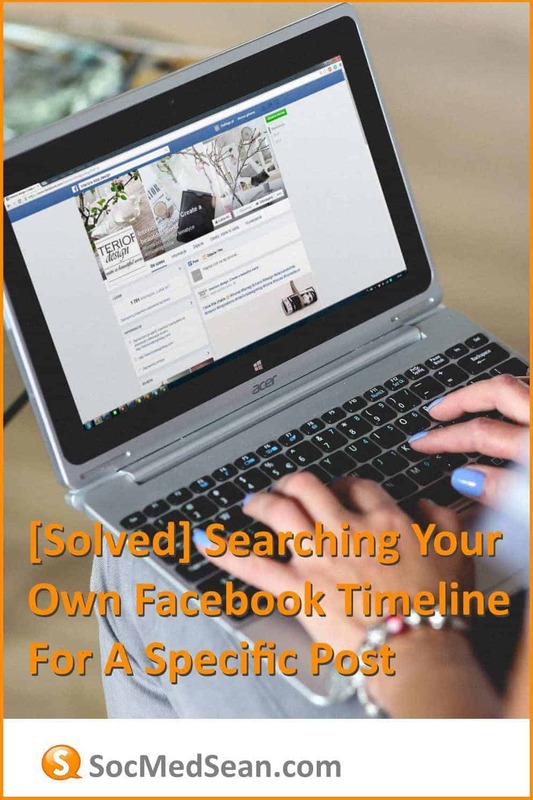 When Facebook introduced their updated search graph a while back, one of the capabilities was the ability to search for posts from a specific person or even posted by you. 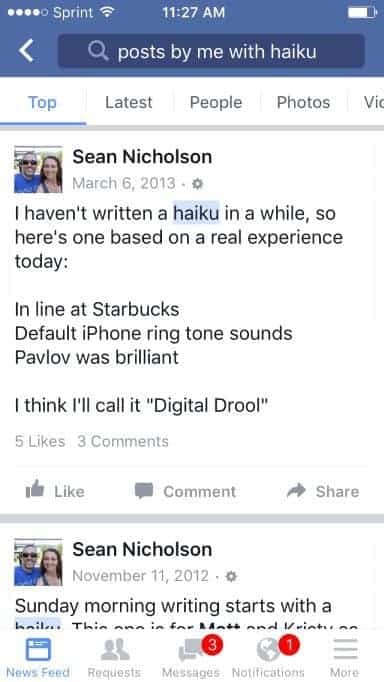 As an example, I wrote a few haikus on Facebook a while back and I wanted to show them to my daughter while she was in the process of writing a haiku for school. In order to do that, I needed to search my own posts for the keyword “haiku”. Keep in mind that my haikus were posted a LONG time ago (relatively speaking in the world of Facebook). 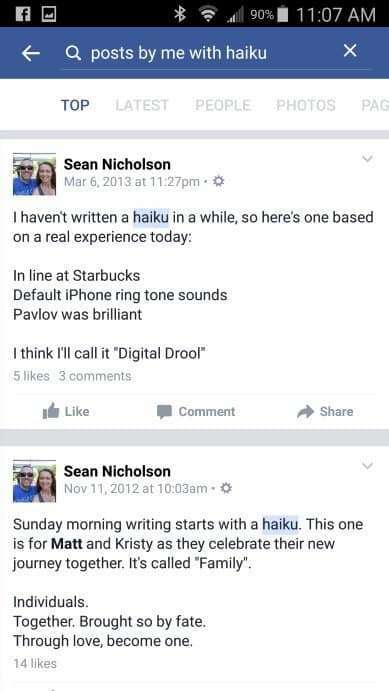 To do this, I simply typed “Posts by me with Haiku” and Facebook returned all posts where I was the author and I included the word “haiku”. Posts – Tells Facebook that we’re searching for post content like status updates, not images or videos. By me – Tells Facebook that I only want to see the posts that I authored. With Haiku – Tells Facebook to find only those posts that have the word Haiku in them. Easy, right? Using this simple structure, you can search back through all your posts, so long as you remember at least one of the words that you posted. You could easily switch up the syntax and ask something about your friends. For example, imagine that you can’t find an awesome infographic that one of your friends posted about social media community management. 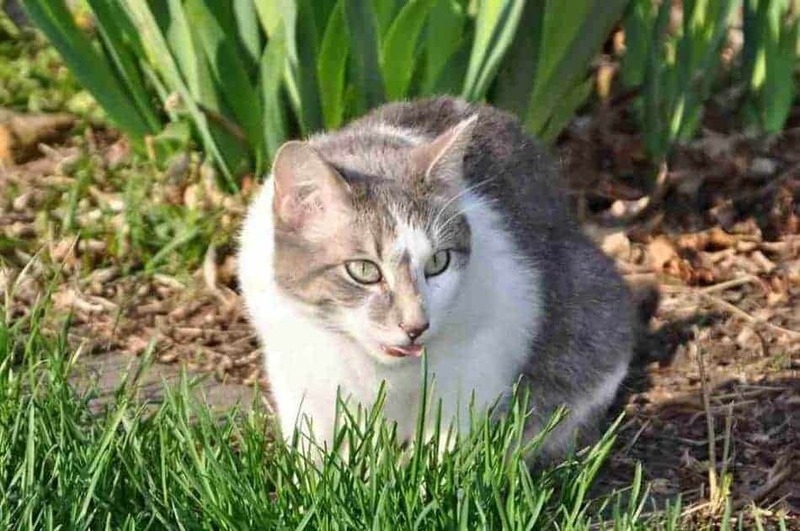 Posts – Search only posts. While most people use the search function to find friends or pages, it really does offer a pretty robust content search capability. Friends of my friends who work for Garmin – COOL! You can actually find out who in your social network works for a company that you might be considering. In addition, because you have a relationship with them (via your friend), you might be able to connect directly with them to ask questions. There you have it. Search capability that allows you to find those posts you were looking for or had maybe even forgotten about. If you really want to dig in and learn more about Facebook search and all of it’s robust commands, there’s a pretty good help section on Facebook dedicated just to search. Great questions came up about whether this solution works on mobile devices. As you can see in the screen capture below, the solution works great on the Android Facebook app. I’ll be testing later today on iOS and will report back. As you’ll see below, testing on an Apple iPhone 5C confirms that the search function works with the most recent version of the Facebook app. If you aren’t able to use the search function, be sure to check to be sure you’re using the most recent version of the app. Some folks have asked whether the solution works on mobile devices. I have tested Android (see results at the bottom of the post) and will be testing an iOS device today. Short answer is that it works great on Android, iOS remains to be seen. Testing on an iPhone has confirmed that the search works in Facebook for iOS, as well (see bottom of this post). If you aren’t able to use the search feature documented below, please be sure that you are using the most recent version of the Facebook app.